Accent Lecterns are more durable, come in more colors and are cheaper than any other type of lectern out there. The Accent Lectern is a patented design that allows for over a 30 foot drop, comes in modern colors like purple and blue, and is made out of materials that don’t break down but can be produced cost effectivly. There is no downside. 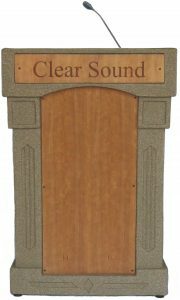 Clear Sound, our sister company also makes a variety of products just for Accent Lecterns also.